Honor grandparents in the wedding ceremony. Poems for grandparents are a wonderful way to honor them on your wedding day. Learn how you can incorporate this loving gesture into your big day. If you're a grandparent, a few helpful tips just might inspire you to compose a poem for the happy couple. 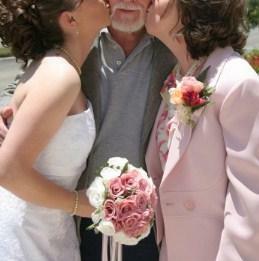 Many people do not get to experience the joy of having a grandparent attend their wedding ceremony. If you are lucky enough to get be surrounded by this special part of your family, you may want to include one or all of them in the ceremony itself. Poetry is a sweet, meaningful way to do this. There is really no more meaningful a wedding gift than a poem written with love. If one or more of your grandparents is gifted with words, consider asking them to write a poem for the wedding. This will not only allow them to play a special part in the ceremony, but add an element of depth and interest for your guests and for yourself. For grandparents looking to write their own poetry, consider these suggestions to help make grandparents' poems for wedding days a touching success. Draw on personal memories. What are the special moments that stand out about that relationship? Try to incorporate some of these into the poem. Reflect on your own wedding day. Do you remember being nervous, excited, or joyful? Weave your own personal experiences into the stanzas. This will add a personal touch. Talk about love and happiness generationally. Discuss not only your own experiences with love and marriage, but the wedding day of your grandchild's parent, if they are still married. It can be very touching to remind the family of a long line of wedded bliss. Don't forget the advice. Part of every wedding day is getting marital advice from those that have been there. Sometimes, couples ask that wedding guests relay this marriage advice through the guest book or in special toasts. Weave some of your good advice into your poem. If you would like to include a grandparent in your ceremony, but don't want them to have to write their own verse, you may want to give them a wedding ceremony poem to read. This poem can have special meaning for you with regards to your relationship with them or your family or it can simply be a poem about the love and marriage you're about embark on. Find inspiration in fond memories. Poetry Foundation: Search the Poetry Foundation for the perfect poetry for any occasion. Keep and Share: Find dozens of free wedding poetry on this great bridal resource. Weddings are about bringing people and families together, not just the couple. The songs, the vows, and the poetry are all very special facets of this unique occasion. Inviting your grandparents to take part in the ceremony tells them and all your guests what's most important to you: sharing the love.